The 2001 Atlantic hurricane season was a fairly active Atlantic hurricane season. The season had 17 tropical cyclones. Out of the 17 cyclones, 15 became named storms, 9 became hurricanes, and 4 became major hurricanes. A "major hurricane" is a storm that is above Category 3 on the Saffir-Simpson Hurricane Scale. The season officially started on June 1, 2001, and it ended on November 30, 2001. This time period is when tropical cyclones usually form in the Atlantic Ocean. These names were used for tropical storms and hurricanes that formed in the north Atlantic in 2001. This is the same list that was used for the 1995 season except for Lorenzo, Michelle, Olga, and Rebekah. Lorenzo, Michelle, and Olga were used for the first time in 2001. Names that were set aside for the 2001 season, but were not used, are marked in gray. The World Meteorological Organization retired three names because of their damage: Allison, Iris, and Michelle. These names were replaced in the 2007 season by Andrea, Ingrid, and Melissa. Allison the first Atlantic tropical storm to have its name retired. ↑ "Worldwide Tropical Cyclone Names". National Hurricane Center. Retrieved 2008-09-19. 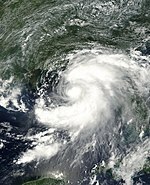 Wikimedia Commons has media related to 2001 Atlantic hurricane season. This page was last changed on 3 September 2018, at 07:51.